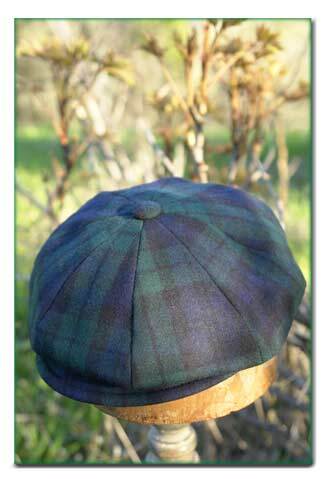 This Hat People Newsboy Cap is a true Black Watch Tartan in a shirt weight Pendleton Wool. Once the outside of the hat is complete and sewn to the size you have ordered, we line your hat with 100% cotton, and sew in the hat band. If the weather turns windy your hat can be adjusted smaller with a 9" internal elastic band, and it can also be washed by hand in cold water. Sizes are measured in inches of circumference and instructions describing how to measure your head with a cloth tape can be found on our Ordering Information page. To view the difference between the Medium, Deep, Full & Extra Full Cuts please visit our Touring Cap Cuts page. Special orders can be arranged by email or by calling Hat People at (888) 930-4287 or (541) 535-5362. We also have many more fabrics in our studio than can be shown on the web, so if you have something in mind that you don't see here, please feel free to contact us directly. There is no additional charge if your special order hat is part of our standard line. Postage within the USA and Canada, by priority mail, is included in the price of the Hat!